The bluray writer is brand new and used frequently which rules out it's removal. I also intend to get a 2x 5.25" backplane to house three 3.5" hard disks, which eats up all of my free bays. A small tube res and a top for the D5 would be ideal, but the budget is non existent now. Second radiator and a few other bits & bobs have now turned up. All the new fittings have had their threads treated with PTFE tape. 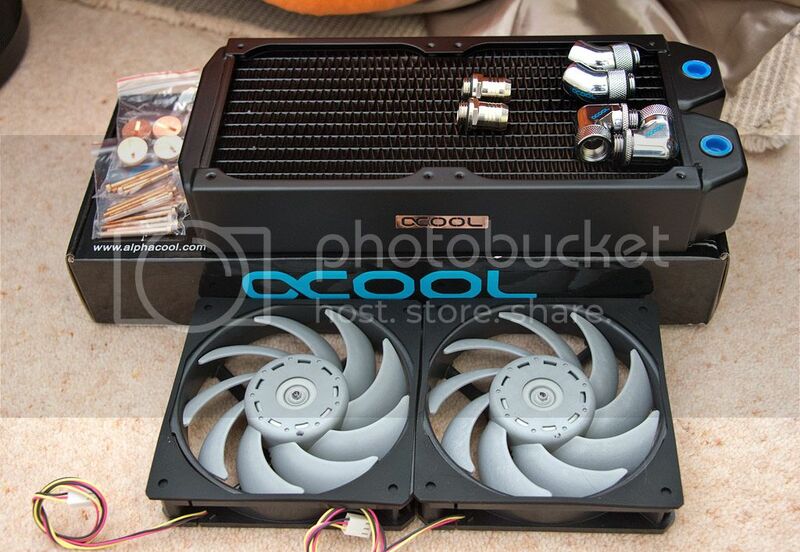 I've swapped the xspc EX over with the alphacool. The XT45 is a very tight fit in the top of the case. All I have left to sort out is the tubing and the location of the pump/res. One minor cockup on my part is that the barbs for the bottom rad need spacers in order for an angle fitting to clear the fans so I've had to fit standard barbs for now. I love the CM690. Kind of regretting swapping mine for the Switch. It's getting there, but it kind of looks like a random array of parts. 5 different fans? It would look better to replace them all with Scythe GTs or something. 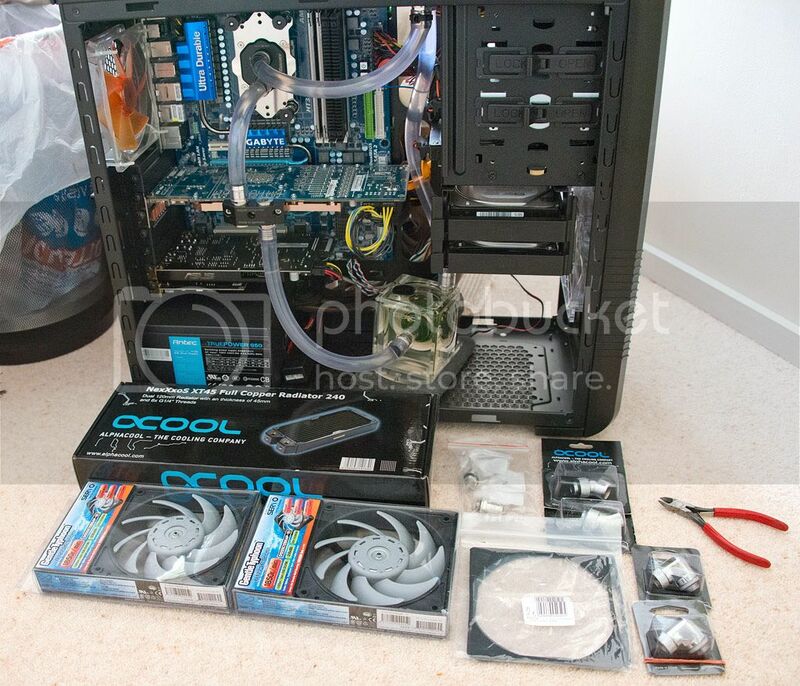 Just find it a little weird that you haven't used two parts by the same manufacturer really... All different fans near enough, 1 XSPC rad, 1 Alphacool, Koolance CPU block, AquaFX GPU block, CM case, Gigabyte Board, Corsair RAM, Antec PSU... Just makes it look more like randomly thrown together rig tbh. 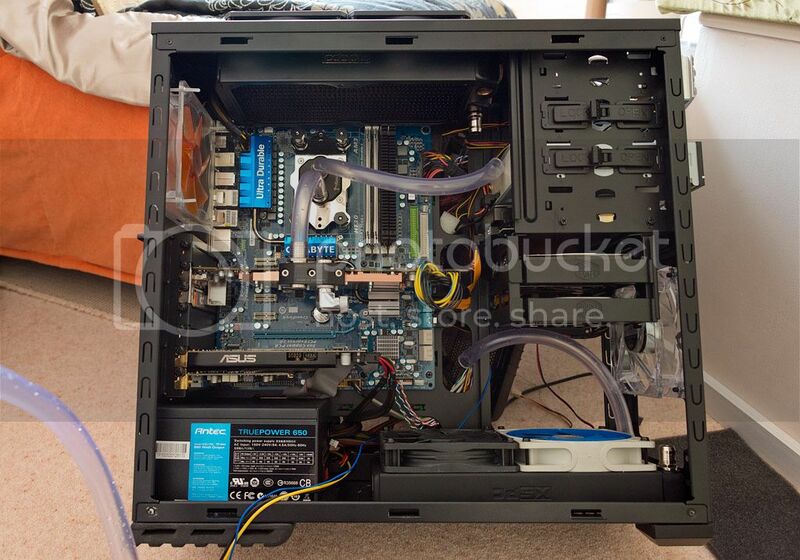 Maybe look at getting Bitfenix extensions on the PSU, along with swapping the fans so it looks more uniformed. And sort out the cables near the optical bays. Was wondering if anyone was going to spot the change of PSU. I swapped the corsair out as the fan noise was just too much. ( near 50dB ) The cable problem round the optical bay is the fan controller cables. I'm going to get the grommets for the cm690 II off the coolermaster site at some point so that any cables that show in the holes presently will be covered. To be honest my pc always has been a thrown together system as i generally combine stuff i already have with new stuff. (like the akasa amber fan which is from 2005) I'd prefer to get new stuff that matches the old but usually it gets discontinued. (the scythe s-flex fan being a prime example) Some of it is bargain bin purchases, like the kingston ram and the alphacool. I am slowly working towards unifying it all, but it'll take time as the car always seems to want money. This is how things have gone so far. 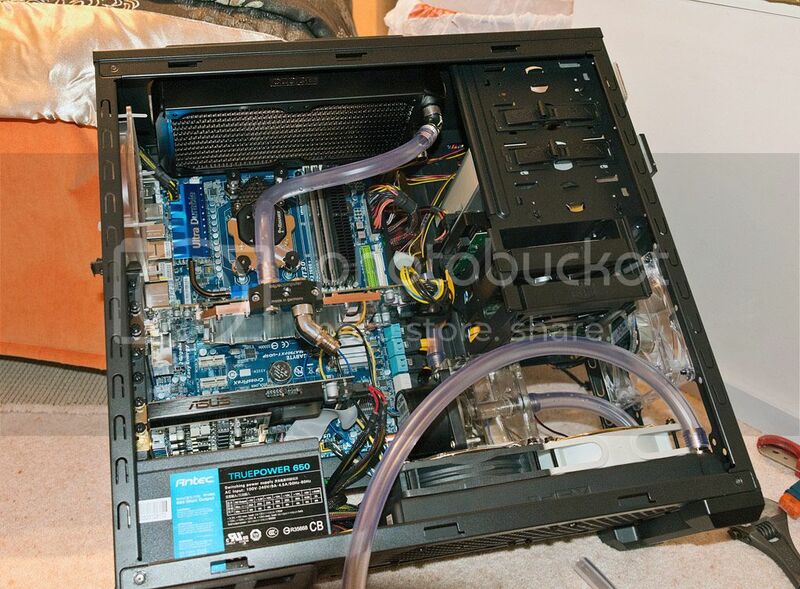 Res/pump will have to sit slightly covering the edges of the fans. (I've fitted some guards so the blades can't contact anything) The tubing seems to be ok now, although i'm dreading the bleeding time. It's much tidier this way around. At least it was nice and easy to turn the radiator, very glad i hadn't started filling it. Going to start the filling/bleeding/leak testing in a minute. 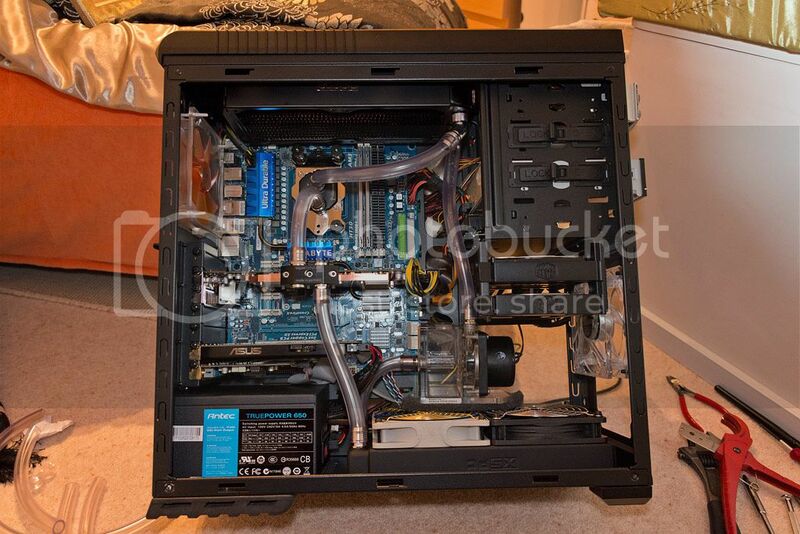 I'm hopefully going to be starting the watercooling on my 690II in the next week or so. Bleeding is taking forever. Don't think I'm going to manage to finish it tonight. No leaks anywhere which is a good sign though.